Our mission was to build a significant customer database for Itis by recognizing as many customers as possible from Itis’ own channels, the 17 million annual visitors to the shopping centre being the main focus. We were tasked to use enriched customer data for personalizing customer dialogue in all communication points and to engage customers between shopping centre visits to get more sales. "Itis focuses on increasing shopping centre traffic, making shopping visits longer, increasing sales and tempting high-end tenants. Itis is the #1 in a customer’s mind when thinking about shopping, the first choice in the immediate and in top three in the regional catchment area. The coverage of Itis’ own media channels is 30% of the immediate and 5% of the regional catchment area. Tenants consider their marketing and PR actions to be the best in the industry. They have the largest share of earned media of all shopping malls in Finland." We started by identifying all the touchpoints where customers interact with It is, and collected marketing permits where volume is high. 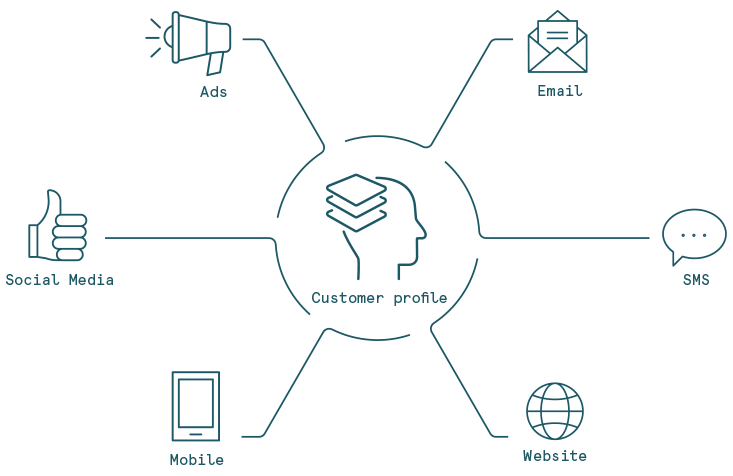 Customer segmentation begins with the very first touchpoint - by using online and offline behavioral data in addition to basic demographics, we are able to be more relevant with our marketing messages. This same customer data and customer segments were made usable for all communication channels, which enables us to tap into new customer potential to constantly expand the target audience across the marketing channels. We drew a map of all customer touchpoints and defined what data needs to be collected, where the data should be stored and in which channels the data should be used. Multiple specialized tools for collecting, storing, analyzing and using customer data have been taken into use and integrated, so that a unified omnichannel customer experience could be built. New marketing actions and services are constantly piloted at low cost and the effective ones are connected as a part of the martech stack. During the fall of 2016 we piloted in-store customer activation using a physically installed beacon solution and a mobile app. The participating customers were recognized when they entered the shopping centre, and an automated SMS message was immediately sent containing weekly special offers. The customer behavior in the pilot was verified through in-store analytics. "Customer database growth: By the end of 2017 the coverage of Itis owned media channels was 25% of the immediate catchment areas, up from 10% in 2016. In-Store pilot: 50% of the pilot participants were recognized inside the shopping centre during the pilot period. For these customers we increased the average visit duration by 6% and cross-shopping by 26% while the pilot was ongoing."